Children today spend on average 50 hours a week on some sort of device and at least 90 per cent of their time indoors. The rate of childhood obesity in North America has gone from seven per cent in the 1980s to 18 per cent in 2012. And preschool-aged children are the fastest growing market for anti-depressants. To Jarrett Krentzel, founder of Hand-In-Hand Early Years Nature Education Program, these are big problems that concern us all, but he knows of one thing that may lead to a solution to these problems—get your kids to spend more time outdoors. There is growing body of evidence that points to a direct correlation between lack of time in nature and the rising rates of depression, attention deficit disorder and other health conditions, particularly in children. On the flip side, there is evidence that time outdoors can actually be beneficial, both biologically and psychologically. For example, the Attention Restoration Theory suggests that the brain relaxes in nature and enters a state of contemplative attention that is both restorative and refreshing. In essence, time in nature can be equated to pressing a reset button on our brain. In fact, researchers for the theory found that a simple walk in nature could improve memory and mood in people diagnosed with depression. Furthermore, biological changes such as reduced blood pressure, reduced stress and increased immunity correlate with quality time spent outside with nature. Krentzel, who has worked as an environmental educator for the past 16 years, is well acquainted with the value of time spent outdoors in nature. He is convinced that giving children access to unlimited, unstructured and creative play time outdoors is one of the most important things we can give them, and it needs to happen when they are very young. 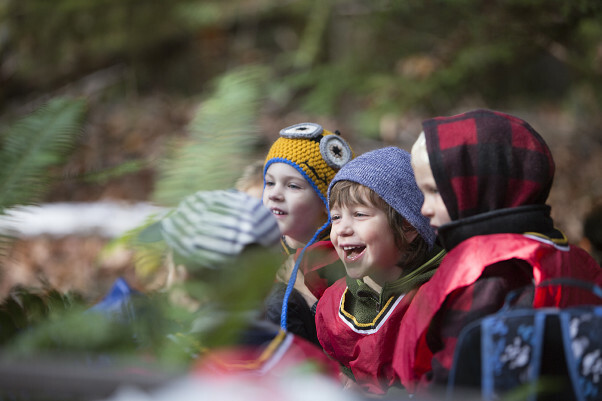 Specifically, Krentzel believes that a child-nature connection and environmental literacy need to be seen as fundamental elements of a young child’s cognitive development. Unlike the pace of our normal life, nature has her own slow pace. According to Krentzel, once we have become attuned to the fast pace of everyday life it can be harder to slow down and commune with nature. “When kids are very young, between the ages of three and five, they haven’t yet become inundated by our fast paced world,” explains Krentzel. “Unless a child has been exposed to the natural world at an early age it’s very hard to capture the interest of children regarding environmental education once they are older. Even kindergarteners are already interested in other things. Right now the young participants of the Hand-In-Hand program are surrounded by falling leaves. Their classroom is the winding trails, the stately trees, the flowing streams and the leaf covered hills that make up the Coal Creek Historic Park in Cumberland. 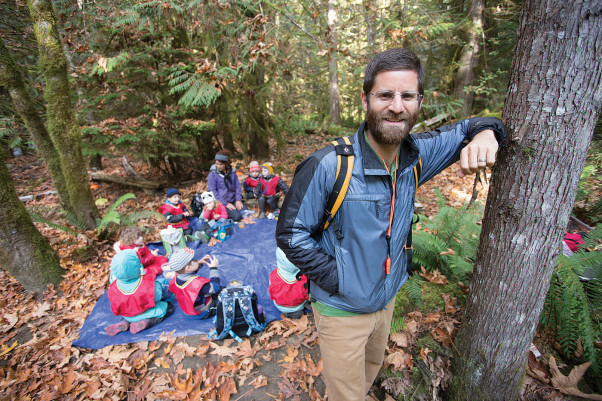 Initially, Krentzel intended to start the first Hand-In-Hand Early Years Nature Education Program in Comox. Specifically, talks were proceeding to conduct the program at the Baybrook House in the Mack Laing Nature Park. But when the Town of Comox decided to demolish the historic building, Krentzel’s initial plans were destroyed in the process. “That was a very difficult time for me as well as for the parents who were extremely interested and waiting to register their kids in the program,” recalls Krentzel. Eventually, Andrew Nichol, chair of the Cumberland Community Forest Society, approached Krentzel about introducing his program within the Village of Cumberland. “Andrew met with me and we walked around the park in Cumberland. I could see that it was a good spot for the program, but most importantly I could see that we would be welcomed in Cumberland. In fact, the Cumberland Community Forest Society, the Cumberland Recreation Centre and the Cumberland Council were all just a pleasure to work with and they are the real heroes in bringing this program to fruition,” says Krentzel. Cumberland’s Coal Creek Historic Park has turned out to be a lovely spot for the program. The covered picnic pavilion, located on the path just past the parking lot, is the meeting place and the anchor point for the program, which consists of two components. The SEEDS program is for three year olds—they meet on Tuesday and Thursday mornings. The ROOTS program participants are the four to five year olds—they meet on Monday, Wednesday and Friday mornings. No matter the day, when the morning starts the parents and children are first able to enjoy time together by completing a craft or other educational activity that has been prepared by one of the instructors beforehand. This overlapping time makes the transition from home to class time smoother and easier for everyone involved. Every day the young children arrive at the pavilion prepared for any sort of weather. Their ‘uniform’ consists of rain pants and gumboots and a backpack carrying a spare set of clothes, a whistle, a snack and a water bottle. “We want them to be comfortable outside in any sort of weather,” says Krentzel. “The only time we will bring the kids under the shelter of the pavilion is if we are worried about falling tree limbs. Otherwise, we are always outside enjoying nature. If it’s warm we take off our jackets. If it’s raining that’s okay because we are wearing our rain gear. When it snows this winter we will be outside in our snowsuits. Aside from the physical and emotional benefit of time outdoors, it’s proven that children who attend nature-based education programs actually fare better academically than those who do not. For example, many studies show that outdoor-based education can lead to better scores in math and reading, improved multi-tasking and problem solving skills, as well as improved critical and creative thinking skills. It’s easy to see why such a program would be popular with parents. And from the number of phone calls and emails Krentzel has received, it’s clear to Krentzel that families want nature based schools available for their children. Krentzel believes parents are attracted to the idea of a nature-based school because it resonates with them and with their values. “Though I understand it, I’m still blown away by the huge response I’ve received from parents,” he says. In response to this incredible demand, the Hand-In-Hand program is expanding throughout the Comox Valley. Krentzel is especially pleased that a Hand-In-Hand program will finally come full circle and begin for Comox families in 2016. As well, there are plans in the works to have a program that serves families in the Merville/Black Creek area starting in 2017. 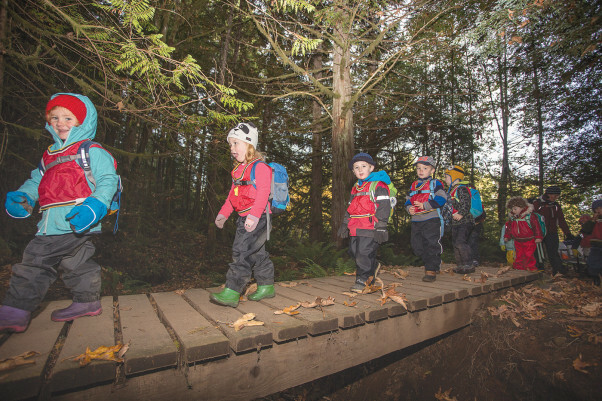 The Hand-In-Hand Early Years Nature Education Program is just one of many nature-based schools that exist on Vancouver Island. 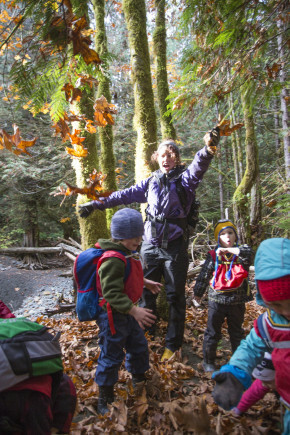 There are nature preschools in Tofino, Victoria, Duncan and Nanaimo, to name a few—and they are growing every year. Planned for the spring of 2016, Krentzel and his associates will bring representatives and families from all of these schools together for the 1st Annual Vancouver Island Nature Preschool Conference… for KIDS only! This will be a fun event for the kids, where educators volunteer their time and the cost to families is by donation only. Krentzel plans to make this an annual event with half of the proceeds going to support a natural environment on Vancouver Island in need of financial support. This year half of the proceeds will go to the Cumberland Community Forest Society to help support the purchase of more forest land that is currently under threat of being logged. “Hosting this event is our way to say thank you to all the parents that supported us and believed in a program that didn’t yet exist,” says Krentzel. “After all, without the support of the parents, we wouldn’t be here today and we wouldn’t be growing at the rate we are. Krentzel strongly believes that connecting our young children to nature will help them protect our environment in the future, and this benefits us all. “My hope is that these children are going to be the protectors of the forest they love,” he says. “When children fall in love with something they naturally want to protect it. These kids are spending a large amount of their time outside in their community forest. They will see the forest close up and intimately every day and in all sorts of weather. They will see, feel and hear the change of seasons. They will learn about the animals and insects that live in the forest.